General elections were held in Italy on Sunday 18 April 1948 to elect the First Republican Parliament. They were heavily influenced by the Cold War confrontation between the Soviet Union and the United States, and are now best known for the covert political warfare waged by the US State Department and Central Intelligence Agency on behalf of the Christian Democratic Party (DC). Election results maps for the Chamber of Deputies (on the left) and for the Senate (on the right). Light Blue denotes provinces with a Christian Democratic plurality, Red a Popular Front plurality, and Gray an Autonomist plurality. After the communist coup in Czechoslovakia in February 1948, the US became alarmed about Soviet intentions and feared that, if the leftist coalition were to win the elections, the communist Left would draw Italy into the Soviet Union's sphere of influence. As the last month of the election campaign began, the magazine Time pronounced the possible leftist victory to be "the brink of catastrophe". The elections were eventually won with a comfortable margin by the Christian Democracy party (Italian: Democrazia Cristiana, DC) that defeated the left-wing coalition of the Popular Democratic Front (Italian: Fronte Democratico Popolare per la libertà, la pace, il lavoro, FDP) that comprised the Italian Communist Party (Italian: Partito Comunista Italiano, PCI) and the Italian Socialist Party (Italian: Partito Socialista Italiano, PSI). The Christian Democrats went on to form a government without the Communists, who had been in government from June 1944, when the first post-war government was formed, until May 1947. The pure party-list proportional representation chosen two years before for the election of the Constituent Assembly, was definitely adopted for the Chamber of Deputies. 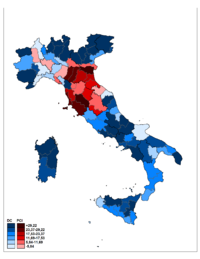 Italian provinces were divided into 31 constituencies, each electing a group of candidates. In each constituency, seats were divided between open lists using the largest remainder method with the Imperiali quota. Remaining votes and seats transferred to the national level, where special closed lists of national leaders received the last seats using the Hare quota. For the Senate, 237 single-seat constituencies were created. The candidates needed a two-thirds majority to be elected, but only 15 aspiring senators were elected this way. All remaining votes and seats were grouped in party lists and regional constituencies, where the D'Hondt method was used: Inside the lists, candidates with the best percentages were elected. This electoral system became standard in Italy, and was used until 1993. The elections remain unmatched in verbal aggression and fanaticism in Italy's period of democracy. According to the historian Gianni Corbi the 1948 election was "the most passionate, the most important, the longest, the dirtiest, and the most uncertain electoral campaign in Italian history". The election was between two competing visions of the future of Italian society. On the one hand, a Roman Catholic, conservative and capitalist Italy, represented by the governing Christian Democrats of De Gasperi; on the other, a secular, revolutionary and socialist society, represented by the Popular Front. The Christian Democrat campaign claimed that in communist countries, "children send parents to jail", "children are owned by the state", "people eat their own children", and assured voters that disaster would strike Italy if the Left were to take power. Another slogan was "In the secrecy of the polling booth, God sees you - Stalin doesn't." The PCI was de facto leading the FDP and had effectively marginalised the PSI, which thus eventually suffered because in the elections, in terms of parliamentary seats and political power; The Socialists also had been hurt by the secession of a social-democratic faction led by Giuseppe Saragat, which contested the election with the concurrent list of Socialist Unity. The 1948 general election was greatly influenced by the Cold War that was starting between the United States and the Soviet Union. The US Central Intelligence Agency, by its own admission, gave $1 million to Italian "center parties". and was accused of publishing forged letters in order to discredit the leaders of the Italian Communist Party. The National Security Act of 1947, that made foreign covert operations possible, had been signed into law about six months earlier by the American President Harry S. Truman. "We had bags of money that we delivered to selected politicians, to defray their political expenses, their campaign expenses, for posters, for pamphlets," according to CIA operative F. Mark Wyatt. It is claimed that the PCI was being funded by the Soviet Union. According to CIA operative Wyatt, "The Communist Party of Italy was funded…by black bags of money directly out of the Soviet compound in Rome; and the Italian services were aware of this. As the elections approached, the amounts grew, and the estimates [are] that $8 million to $10 million a month actually went into the coffers of communism. Not necessarily completely to the party: Mr. Di Vittorio and labor was powerful, and certainly a lot went to him," according to the former CIA operative. Although the numbers are disputed, there is evidence of some financial aid, described as occasional and modest, from the Kremlin. PCI official Pietro Secchia and Stalin discussed financial support. The Christian Democrats eventually won the 1948 election with 48% of the vote, and the FDP received 31%. The CIA's practice of influencing the political situation was repeated in every Italian election for at least the next 24 years. A leftist coalition would not win a general election for the next 48 years, until 1996. That was partly because of Italians' traditional bent for conservatism and, even more importantly, the Cold War, with the US closely watching Italy, in their determination to maintain a vital NATO presence amidst the Mediterranean and retain the Yalta-agreed status quo of western Europe. Christian Democracy won a sweeping victory, taking 48.5 percent of the vote and 305 seats in the Chamber of Deputies and 131 seats in the Senate. With an absolute majority in both chambers, DC leader and premier Alcide De Gasperi could have formed an exclusively DC government. Instead, he formed a "centrist" coalition with Liberals, Republicans and Social Democrats. De Gasperi formed three ministries during the parliamentary term, the second one in 1950 after the defection of the Liberals, who hoped for more rightist politics, and the third one in 1951 after the defection of the Social-democrats, who hoped for more leftist politics. Following a provision of the new republican constitution, all living democratic deputies elected during the 1924 general election and deposed by the National Fascist Party in 1926, automatically became members of the first republican Senate. ^ Corke, Sarah-Jane (2006-05-01). "George Kennan and the Inauguration of Political Warfare". Journal of Conflict Studies. 26 (1). ISSN 1715-5673. ^ Mistry, Kaeten (May 2011). "Re-thinking American intervention in the 1948 Italian election: beyond a success–failure dichotomy". Modern Italy. 16 (2): 179–194. doi:10.1080/13532944.2011.557224. ISSN 1353-2944. ^ The number of seats for each constituency went from 1 for Aosta Valley to 36 for Milan. ^ CIA memorandum to the Forty Committee (National Security Council), presented to the Select Committee on Intelligence, United States House of Representatives (the Pike Committee) during closed hearings held in 1975. The bulk of the committee's report that contained the memorandum was leaked to the press in February 1976 and first appeared in book form as CIA – The Pike Report (Nottingham, England, 1977). The memorandum appears on pp. 204-5 of this book. ^ a b "CNN Cold War Episode 3: Marshall Plan. Interview with F. Mark Wyatt, former CIA operative in Italy during the election". CNN.com. 1998–1999. Archived from the original on August 31, 2001. Retrieved 2006-07-17. ^ Corke, Sarah-Jane (2007-09-12). US Covert Operations and Cold War Strategy: Truman, Secret Warfare and the CIA, 1945-53. Routledge. pp. 49–58. ISBN 9781134104130. ^ "N.A.T.O. Gladio, and the strategy of tension". Chapter from “NATO’s Secret Armies. Operation Gladio and Terrorism in Western Europe”, by daniele Ganser. October 2005. Retrieved 2006-07-21. Wikimedia Commons has media related to Elections in Italy (1948).